The following brief glossary of key terms is provided as a ready reference, for anyone who needs a reminder during reading of some of my distinctive uses of terminology. The glossary here consolidates those in all four volumes. Any frequently used terms not in it can reasonably be assumed to follow a standard English dictionary definition. This glossary does not include terms for cognitive biases and fallacies (except when they are coinages of mine), because these are largely shared with a wider intellectual tradition. Instead, these have been given in a separate glossary. Warning: Brief definitions have a value in initial learning and orientation. They are never absolutely adequate when closely analysed. Aesthetic objectivity The aspect of objectivity (q.v.) applied to judgements of beauty (not a distinct type of objectivity, but a way that objectivity in general can be applied). Agnosticism The deliberate avoidance of either accepting or rejecting a claim, particularly a metaphysical claim. In Middle Way Philosophy this term is roughly equivalent to hard agnosticism used elsewhere. It does not imply either indecisiveness or an expectation of further evidence. Agnostic foundationalism The requirement that a necessary (but not sufficient) condition for justification is the recognition that one may be wrong, either in positive or negative claims. Alienation An extreme conflict of desires created by repression (q.v.) of some desires by other dominant and socially supported desires. Asymmetrical integration The achievement of integration of one type or in one area to a greater extent than in another. Cognitive bias A habitual distortion of judgement or delusion found to some extent in all human beings. Although the use of this term creates a helpful connection with the psychological research on cognition, I do not consider cognitive biases to be solely cognitive, nor a defect of ‘rationality’. Coherentism The requirement that a condition for justification is the logical or explanatory coherence of a new belief with our existing beliefs. In Middle Way Philosophy this is a necessary but not a sufficient condition for justification. Compassion The aspect of objectivity (q.v.) applied to the extension of identifications with ourselves or others. Objectivity, including compassion, can be developed, whilst empathy (an emotional capacity) may be a result of conditions. Conditions The way things appear to be as they impact on us from the outside (or inside) world. Many writers use the terms ‘reality’ and ‘nature’ for this concept, both of which I prefer to avoid because of their metaphysical connotations. Dialectic A process of uniting or synthesising apparently opposed entities, where both are assumed to address conditions to some degree but to be limited by unnecessary opposed assumptions. In Middle Way Philosophy this is an epistemological process rather than a historical one. Dispositional objectivity Objectivity (q.v.) seen as the characteristic of a person and their habits. Dogmatism The psychological expression of metaphysics, where beliefs are held strongly because they are thought to be intrinsically true, regardless of experience. Hence Dogma, a metaphysical belief considered psychologically. Dualism The belief (or implicit assumption) that a metaphysical understanding of experience is unavoidable, or even to be welcomed. Embodied meaning An understanding of meaning based on a recognition of how the physical body creates meaningfulness. Factual objectivity The aspect of objectivity (q.v.) applied by an individual to reach a degree of understanding of facts – that is, of how things are as far as we can ascertain. Fallacy Unjustified assumption (q.v. justification) made in reasoning. Functionally equivalent to cognitive bias (q.v.). Falsifiability The potentiality for falsification (q.v.) of a theory in a coherently imaginable scenario. Falsification The justifiable (but not certain) conclusion that a theory is wrong because of its incompatibility with evidence. In Middle Way Philosophy falsification can be undertaken by individuals, not just by scientists using strict research methods. Group An association involving shared identifications between two or more people. Identification The sense of possessiveness towards oneself, a person or an object, making them in some sense “me” or “mine”. Image schema Basic pattern in embodied experience that can be associated with symbols to make them meaningful. E.g. the ‘source-path-goal’ schema makes the word ‘path’ meaningful. Incrementality The conceptualisation of qualities as a matter of degree on a spectrum, rather than as absolutes that are either existent or non-existent. Incrementalisation The process of re-conceiving absolutes as a spectrum of qualities that are a matter of degree. Integration The progressive uniting of apparently opposed entities by incrementalising (q.v.) them and adopting the qualities of each to the extent that they address conditions. This is a dialectical process (q.v.). Judgement The forming of a representation or response that ‘freeze frames’ our experience and commits us to assuming a particular state of affairs. This then enables us to act according to that assumed state of affairs. Justification The finding of adequate (though not certain) reasons to believe or disbelieve a claim. In Middle Way Philosophy this requires both coherentism (q.v.) and agnostic foundationalism (q.v.). Meaning The habitual attachment of desire to a symbol through the neural networks, physical associations, and cognitive models we have developed. Metaphysics Positive or negative claims that are asserted without any possible justification (q.v.) from experience, using absolute claims or absolute sources of justification (or their denial), and a lack of any possibility of incrementalisation (q.v.). The identification of metaphysical claims is always dependent on context and use rather than just wording, and is not independent of the psychology of the person believing them. 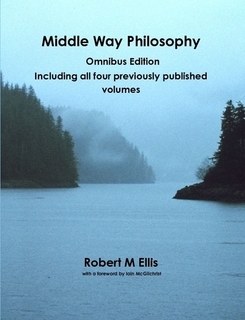 Middle Way A philosophical and practical approach that avoids both positive and negative metaphysical claims, seeking to address conditions by adopting beliefs that go beyond the assumptions of both sides. Moral objectivity The aspect of objectivity (q.v.) that is applied to moral judgements as to how to live and act (not a distinct type of objectivity, but a way that objectivity in general can be applied). Negative metaphysics Claims about the non-existence of a metaphysical (q.v.) entity beyond experience. Non-dualism A philosophical and practical approach which avoids the assumption of absolute metaphysical entities or their denial. Objectivity The incremental (q.v.) quality of the judgement of a person or group of persons that enables them to understand and address conditions (q.v.). In Middle Way Philosophy this term does not mean ‘a God’s eye view of the universe’. Positive Metaphysics Claims in support of the existence of a metaphysical (q.v.) entity beyond experience. Pragmatism A philosophical approach that emphasises practical usefulness rather than adherence to an absolute view of how things are. In Middle Way Philosophy this practical usefulness is understood in a long-term sense. Provisionality The psychological state of holding beliefs flexibly enough to enable them to be changed in the light of new evidence. This also requires the avoidance of metaphysical beliefs because they cannot be held in this way. Psyche The total potential identifications of a given ego, into which current identifications may be integrated. Representationalism The belief that language has only cognitive meaning gained from its representative relationship with the world (for example through truth-conditions). Repression The denial of one desire by another, in which the dominant desire attempts unsuccessfully to completely eliminate the subordinate one. Revelatory metaphysics The type of metaphysical claim that appeals to an absolute (usually religious) source for its justification. Scepticism The belief that no claims (or their denials) can be certain. Scientific Objectivity The aspect of objectivity (q.v.) which is applied to theoretical judgements about the universe using scientific method (not a distinct type of objectivity, but a way that objectivity in general may be applied). Some of this objectivity may be individual, some the quality of scientists as a group. Suppression The aware and temporary adoption of one desire as dominant over another, and denial of immediate expression to the subordinate desire. This is distinguished from repression (q.v.) by continuing recognition of the subordinate desire. Temporary integration A state of integration entirely dependent only on immediate conditions, and thus likely to be of short duration – e.g. a state of inspiration or meditative absorption. Truth on the edge The regulative idea of an ultimate state of affairs, which is meaningful but cannot be the object of justified assertions.